Alfa Laval STNX decanter centrifuge range is used for a wide range of different starch processing operations, such as dewatering of heat-coagulated potato protein and maize gluten, wheat starch, and protein splitting. 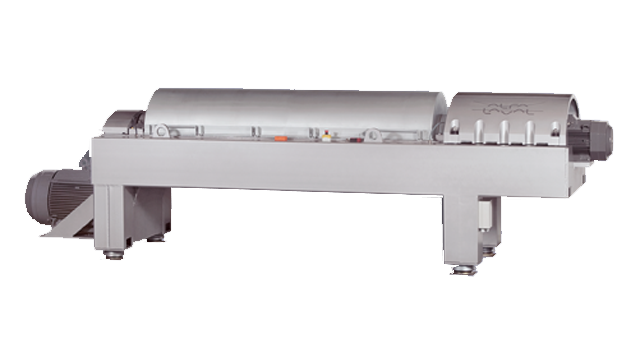 Alfa Laval STNX decanter centrifuges are used for a wide range of starch processing operations. These include dewatering heat-coagulated potato protein and maize gluten, 2-phase and 3-phase wheat starch and protein splitting, and fruit juice separation and fibre dewatering in the potato and tapioca starch industries. The design of the conveyor provides better control of how the machine performs. It also has replaceable wear lines in the feed zone, and a full-flow open feed zone that helps prevent blockages. Better flow distribution also boosts performance. The back drive features a direct drive gearbox, a unique Alfa Laval system for automatically controlling the differential speed between the bowl and the conveyor. This makes it easy to maintain the best possible balance between liquid clarity and solids dryness, irrespective of variations in the feed. It also results in big savings in energy. And because the pinion shaft only turns in one direction, the unit is also much easier to control than with traditional methods. The Alfa Laval STNX is controlled by a special control system designed to make sure the operation of the direct drive always corresponds to the solids load in the bowl, thus saving energy and improving separation performance. The DCC also monitors a series of operating parameters to ensure easy, safe and reliable operation at all times. External bus options for control equipment from several major manufacturers make it easy to integrate this system into other plant control systems. Separation takes place in a horizontal cylindrical bowl equipped with a screw conveyor. The product is fed into the bowl through a stationary inlet tube and is then smoothly accelerated by an inlet rotor. Centrifugal force immediately makes the solids build up on the wall of the bowl. The conveyor rotates in the same direction as the bowl, but at a different speed. This moves the solids towards the conical end of the bowl, where they exit through the solids discharge openings into the casing. Separation takes place along the entire length of the cylindrical part of the bowl, and the clarified liquid leaves the bowl by flowing over adjustable plate dams into the casing.